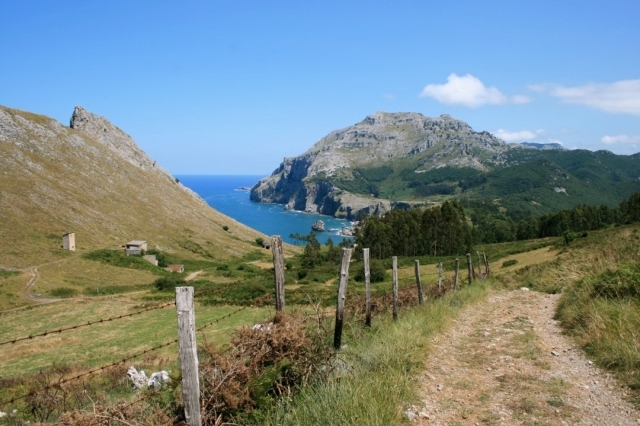 Pilgrimage route via the Asturian- Galician coast, the Camino dates back to the IX century. Reaching Galician soil in Ribadeo. Introduction The Jacobean phenomenon is a complex network of networks, interwoven by as many routes as points of departure, routes that have long been established by primitive pilgrims. The Northern Way or the Camino of the Coast winds around the Cantabrian coast, from Irun to Compostela, along the northern edge of the peninsular. The Northern Way has multiple variant routes, which, bypass riverbanks and sea inlets until reaching interior Galicia. The journey, in this case, focuses on two principal towns or locations that define the route to follow: Oviedo and Ribadeo. From Oviedo hikers can choose to head towards the interior, to Lugo, continuing along the Primitive way or, can keep north, close to the coast, in the direction of Avilés, towards Vegadeo and, on continuing, to Ribadeo, the doorway to Galicia. Originally pilgrims from here had little option but to embark in order to cross the channel, hence another variant was born, over the bridge of Abres that crosses the waters. This route converges in Lourenzá with a busier route. With the discovery of the tomb of the apostle Santiago in the year 813, under the reign of Alfonso II, the Hispanic population of the northwest focused their attention on Christianity. The French Way was enhanced in an attempt to strengthen ties among the Christian kingdom of the northern peninsular. Despite this effort, the Cantabrian Caminos, with Oviedo as a great pilgrim reference point, conserved the mighty international Jacobean stream, both by land and sea from France, with pilgrims arriving frequently to Basque and Cantabrian ports from Atlantic countries. The pilgrimages of those pioneers helped to further establish the Northern Way, the same route taken by penitents such as Saint Francis of Asís, whom, in the year 1214 ventured on, according to tradition, a hike to San Salvador of Oviedo and to Compostela. The Northern Way is by no means as busy as the French Way, quite the opposite. For this reason it does not have an infrastructure focused on pilgrims. However, some attempts have been made and there are signposts with the scallop shell and strategically placed yellow arrows, thanks to the association of Amigos del Camino. Only a few urban stretches may result in confusion. A tranquil route, demanding through the mountains and at times difficult due to the weather, filled with green solitary landscapes in the interior, marked by legendary locations that define the stages of the route. The Galician stretch, from Ribadeo, involves a hike of 197 km, almost the required distance to obtain the Compostela by bike (200km). Continuing to Lourenza and Mondonedo, resting in the plains of Terra Chá and its capital, Vilalba and, receiving the hospitality provided by the Cistercian monastery of Sobrado dos Monxes before connecting in Arzua with the busy French Way. From here travellers from all other variant routes share the same Camino or at least in Galicia they all lead to Santiago.